As shoppers are becoming more channel-agnostic, and more omnichannel in their customer journey, the retailers that are breaking through and meeting their demands are realizing the greatest returns this holiday shopping season. It’s no longer about brick and mortar vs. e-commerce. Today’s successful retailers know they need to make the customer journey a seamless experience across all channels and all devices so consumers don’t feel they have to choose. Traditionally, retailers had their own unique advantages, from the instant gratification of an in-person purchase, to a national store infrastructure that can provide quick fulfillment or in-store pickup for online purchases. As e-commerce giants close the gap with same-day and next-day delivery options, free shipping, and even pop-up stores, the lines have blurred and traditional retailers have had to up the ante to keep their competitive edge. More than half of Internet shoppers say that delivery speed was important in their purchasing decisions, and 61 percent say they would be willing to pay an additional fee for same-day delivery. 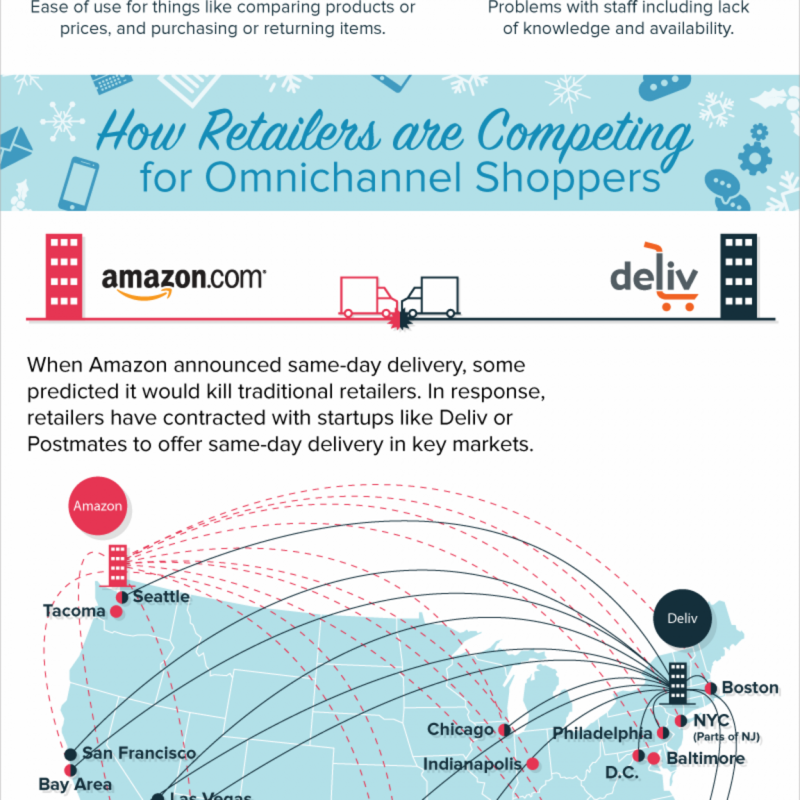 In response to Amazon’s increased delivery options, some retailers have turned to startups like Deliv to meet customer demand for same-day delivery in key markets. To stay ahead of the competition in 2015, Home Depot went as far as opening dedicated online fulfillment centers in some markets to ensure delivery within two days. In turn, the company was described as one of the “most omnichannel holiday yet” retailers by Credit Suisse. 91% of customers want to pick up where they left off when they switch between channels, so the retailers that are winning the omni-channel game are creating a connected shopping experience across all channels. This is no easy feat. It requires a data strategy that allows retailers to not only combine all of their online and offline data, but also to have the capability to use it and respond to customer behaviors in real time. The results of an omnichannel strategy are clear – these consumers have a 30% higher lifetime value than single-channel purchasers. However, many retailers have lagged behind due to challenges such as siloed data, associate training and technology integration. There may be a lot of barriers but there are even more opportunities for retailers that get onboard with an omnichannel strategy in 2016. Stuart was Signal's VP of Sales for North America. With experience in both digital marketing and marketing analytics, Stuart has held key management roles at Nielsen, Infogix, and SPSS, which was acquired by IBM.